This residence is situated on a point at lands end, bracketed with mature white oak and loblolly pine trees. showcasing a wide variety of designs and for encouraging quality design for everyone. This year one of the 12 featured homes was Buckeye Trail. Buckeye is an excellent example of the collaborative efforts of architect Mark Canada and general contractor Steve Wauson to reclaim and restore a home through adaptive reuse of a 20 year old duplex and bring it new life as a luxury “green” sustainable custom residence. Mark W. Canada, A.I.A., believes that the best architectural solutions derive from clear communication and equitable concerns for value - whether personal, collective or economic. The architect is in the unique position of instilling such values through his work, thus, his responsibility to the client, the community and the environment is set to task. 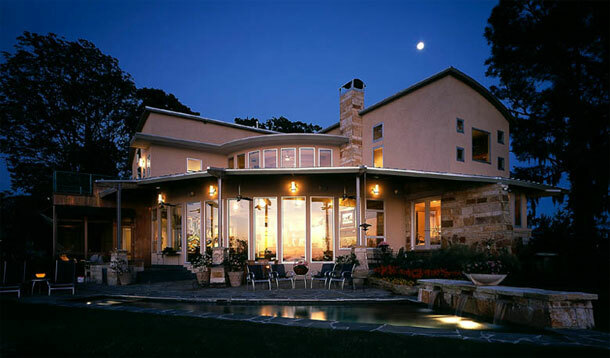 Canada, has been providing professional architectural services since 1984.Specializing in custom residential design; Mark W. Canada has been the architect for some of the most spectacular custom residences in the Austin, Texas, area. His award-winning designs are site sensitive, take maximum advantage of the views, are passive solar and defy stylistics patterns. Passive Solar Energy Design Techniques, a Green Building Approach and an intuitive Feng Shui friendly design philosophy are integral with design at Canada + Associates, Architecture. Throughout the processes of programming, site planning, design and construction detailing, a holistic environmentally responsible approach towards contributing to our built environment is considered elemental. Canada + Associates is currently expanding its horizons with the development of a programming, feasibility analysis and schematic design package for a large-scale project defined as the Austin Scottish Rite Learning Center at the Children’s Village within the Mueller Redevelopment site in Austin, Texas. www.muelleraustin.com. Public Hi-Fi was designed as the recording facility for a nationally acclaimed band. Acoustic privacy was elemental and imperative. The architecture was dictated by the owner’s program requirements to blend into the residential character of the 1940’s neighborhood. "You have to consider your client. Only out of that can you produce great architecture. You cannot work in the abstract"